I love this time of year – what chef doesn’t? Every corner of the kitchen garden is brimming with fresh, seasonal produce and for a few short months Scotland comes into its own with an abundant harvest of berries. 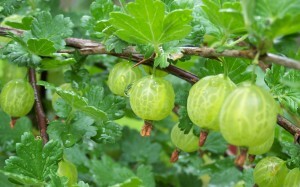 Now, I could do the predictable thing here and go strawberry or raspberry but as a man who prefers to champion the underdog I’m going to surprise you all – let’s chat gooseberries! Busting with flavour – nothing tastes quite like a gooseberry – this is one of those fruits you give to a child when you’re feeling particularly mischievous! Likely to contort your cheeks into a yoga pose rarely achieved, these firm tart berries are often seen as a bit of an ugly sister when held up against their pretty red summer counterparts. They come into season in July which is probably why they’ve been cast hastily aside in favour of the naturally sweet taste of strawbs and rasps. With their fine hairs, earthy texture and green taut skin they feel decidedly autumnal – as though they’ve turned up to the party in the altogether wrong outfit! However, I would certainly put my money on a gooseberry to win in a fight with a strawberry. The robust flavour and character make it one of the best fruits in a crumble, the ideal main ingredient for a pickle and a perfect companion, with just the right amount of acidity and sweetness, to lift the flavour of flame roasted mackerel fillets. Food of the Gods! Most recipes – both savoury and sweet – use a gooseberry compote as a base which is simply a mixture of gooseberries, sugar and a splash of water reduced down over a low heat. Start with two parts gooseberry to one part sugar and adapt to suit the sweetness / tartness of the berries and your own taste. Once cooled, you can freeze the mixture and use as required in crumbles, sorbets, chutneys and more. As well as bringing a bold burst of flavour to proceedings, gooseberries – like most of our gifts from nature – boast any number of health benefits. They are packed full of vitamin c, are a great digestion aid and have been said to be a winner when it comes to detoxifying the body. And quite apart from all of that, they deliver the best fruity punchline ever told: What’s green and hairy and goes up and down? A gooseberry in a lift. TOP TIP: Embrace the season and use this gorgeous bright green berry for a wonderfully tart pavlova. With your base ready, gently cook the gooseberries with sugar over a low heat for 15 minutes. Allow to cool before pouring in some elderflower cordial and folding in some whipped cream. Top the pavlova and decorate with fresh gooseberries and flaked almonds for a delicious showstopper of a summer pudding.